Someone at my last guild meeting asked me if I had any ideas on items she could put on her Christmas wish list. 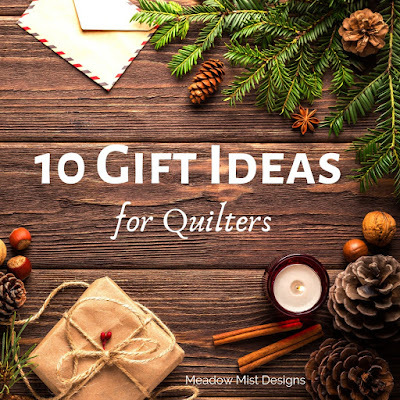 I suggested a bunch of my favorite sewing notions and thought it might be fun to also share here...10 great gifts for quilters. Bloc-loc rulers are the only specialty rulers that I use on a regular basis. The have a grove cut into the back of the ruler so the seam (pressed to the side), nests in the grove for accurate and quick cutting. The 6 1/2" half square triangle ruler can be used to trim any HST up to 6 1/2". I have a little tutorial on the blog showing how to use the ruler here. These are my go to's for cutting my fabrics. The Olfa cutting mat is so durable, mine is over a year old and still looks new. I recommend asking for the biggest size that your space will allow. I went from an 18" x 24" to a 24" x 36" and it makes cutting so much easier. Most of us should be changing out our sewing machine needles more frequently than we do. I use Organ needles which are so inexpensive, there is no excuse not to change them as often as we should. You can buy 100 needles for around $10 (so about 1 cent per needle). I have used them in my Bernina for years with no problems. It is always magical when you go into your thread area and already have the perfect matching thread to your project. Thread is a great stocking stuffer and getting it as a gift is a wonderful way of building up the colors you have on hand. Consider putting some different weight threads on your list too, 50 wt is great for piecing and quilting, but some of the thicker weights 40 wt, 28, wt, 12 wt can create different looks for your quilting designs. I use a simple and inexpensive photography backdrop holder to hold up my quilts for pictures. It is far from a professional setup, but the holder does a good job of holding up the quilt flat so I can take a good full picture of the the finished quilt. Whether you are taking pictures of quilts to enter into quilt shows or just to keep a record of your finishes, having a reliable way to get a good flat shot of the quilt is important. I love my large Bernina, but don't bring it to classes because it is so heavy and I am afraid it might break. A few years ago I purchased this Brother quilting and sewing machine and it has been fabulous. It is super light and small for traveling, but really has great stitch quality and no tension issues. Plus, it came with an extension table and a bunch of presser feet. You can't beat a good quality sewing machine for less than $150. I hope that I gave you some ideas of what to ask for this holiday season. What is on your wish list? Perfect list! I like giving Aurifil threads in neutral colors too, and the needles is a great idea! Giving those things we use up and need more is my usual choice too. 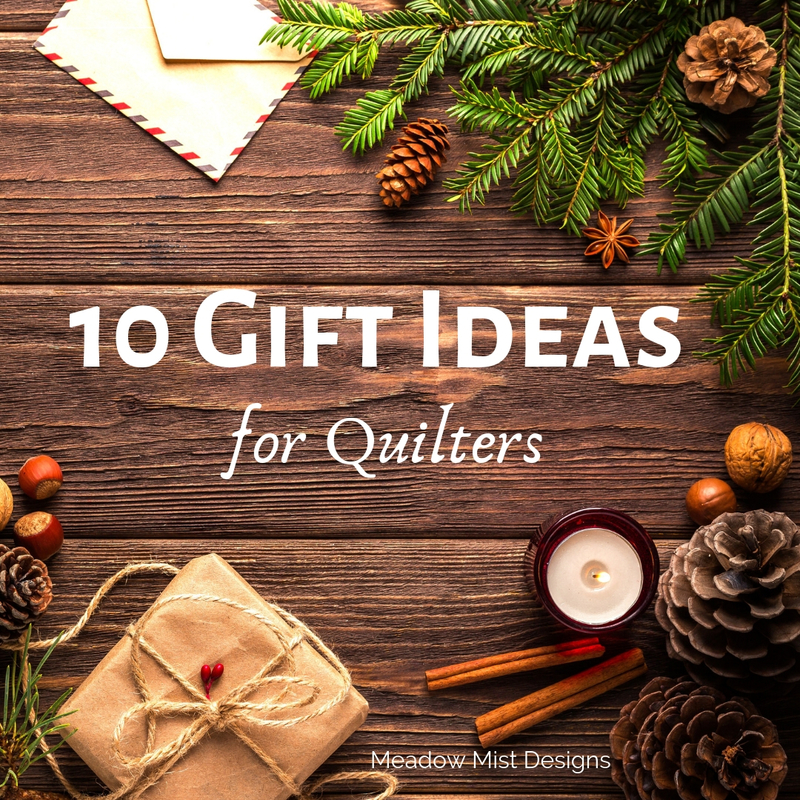 Could the quilt stand be used as a design wall? Put a piece of flannel on it and then place blocks on? Or is it too likely to tip over? I do not think that the quilt stand would be a good design wall, I think that as you tried to put the blocks on it, the flannel would swing back and forth and the blocks might fall off. Cheryl, this is an excellent post! My favorite takeaway is the bit on sewing machine needles! I have never heard of those and I am going to click through and order them right now. Thank you for that!!! Gingher scissors are a great idea. I have been wanting some for a while now. Same with Bloc Lock rulers - haven't tried them yet but every quilter that has one loves it. Very practical list but things we are likely to want and use! It's also time for me to get a new seam ripper! I like to have an extra on hand because the one I use will inevitably break at a bad time. :) I also use my stiletto a lot. Oh, great list! I’ll have to forward this along to amfew people, lol! What a great list! I'll have to take a look at those rulers, I've not seen those before. Does the quilt stand handle large quilts well? The description makes me think a completed full or queen quilt might be too heavy for it. Fall 2018 Tips and Tutorials Festival ++ Linkup!